Restaurants from La Cruz de Huanacaxtle, Bucerías, Nuevo Vallarta, Punta de Mita and more than 80 local artisans, craftmen and purveyors will be offering their unique regional art, crafts, clothing, jewelry, drinks and food. 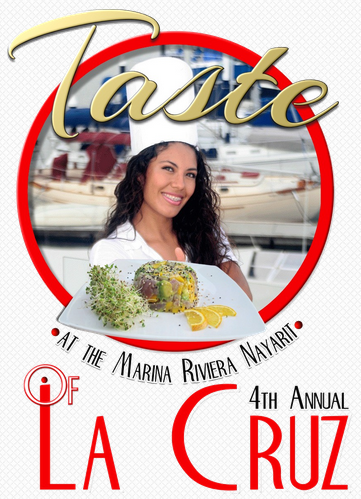 Tha Saturday January 24th 2015 marks the 4th Annual Taste of La Cruz from 3pm-7pm. It will be held in La Marina Riviera Nayarit in La Cruz de Huanacaxtle. The ticket’s cost is $150 pesos and includes a free drink. This event will feature a unique blend of businesses, services and restaurants including this year’s sponsors: Los Arroyos Verdes, Best of Bucerias, Café Des Artistes/Tuna Blanca, Frascati, Grupo Chalita, A Hand In The Kitchen, Hotel Cielo Rojo, Inside La Cruz, Marina Riviera Nayarit, Mex-Eco Tours, Puerto Bahia, and Sonora a La Parrilla. Also promoting and supporting the event is Riviera Nayarit Convention and Visitors Bureau. In addition, over 80 local artisans, craftsmen and purveyors will be offering their unique regional art, crafts, clothing, jewelry, drinks and food. Event organizers have been encouraging entrepreneurs, businesses, services and restaurants to sign up for the mid-January event as quickly as possible to ensure a space on the Malecon. Taste of La Cruz offers a unique opportunity to promote commerce to an excited, captive audience. The exciting musical lineup will feature flamenco group Tatewari, Latin/Swing performers Al & Zoe and The Banderas Bay Jazz Allstars in the Xiriki Marina Amphitheater throughout the afternoon and early evening. As with past years this event will draw visitors from throughout the Riviera Nayarit and Puerto Vallarta region as well as Tepic, Guadalajara, San Blas, Mexico DF, Leon, San Miguel de Allende, Guanajuato and Queretaro. The previous three events were phenomenal successes attracting thousands of visitors to La Cruz de Huanacaxtle and the Marina Riviera Nayarit. Exhibitors were unanimous in their praise of the expo/fair in its efficacy in providing an exciting and vibrant avenue for the promotion of their businesses. Visitors were likewise thrilled with the festival atmosphere, delicious food and drink and the variety of intriguing businesses and entrepreneurs in such an impressive setting.